The MJB range provides a simple, low cost but effective solution for the connection of high voltage cables. Its design allows 180 degree in/out cabling and is used primarily for jointing cables or as a connection box. The MJB is suitable for up to 4 phase connections (top & bottom) and a maximum of 8.3kV. 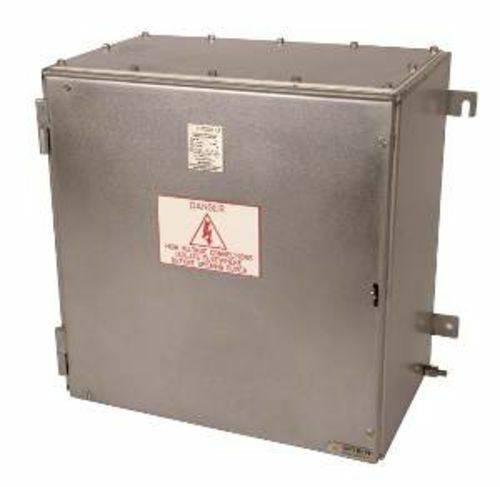 The standard enclosure is manufactured from 316L stainless steel (EN 1.4404) with a silicon gasket and stainless steel fasteners. The MJB also features heavy duty machined hinges with lift off cover pad-lockable cover. It has an orbital finish but painted and electro-polished options also available.